Here is a quick and easy tutorial on how to make a simple pluck using the Reaktor SoundSchool Analog synth, which is part of the factory library collection. Perfect for new and old electronic music genres alike! This lesson is one that won’t take long to get through and will add one more synth to your arsenal when designing old school analog sounds. Although this tutorial focuses on a simple pluck, the Reaktor SoundSchool Analog synthesizer is capable of a whole lot more. And it provides a certain quality in the sounds it produces that is reminiscent of hardware from years gone by. The interface is easy enough to grasp and navigate, so this should be an easy one to follow along with regardless of your experience level with Reaktor or sound design. Begin by starting a new ensemble in Reaktor. Then load up an instance of SoundSchool Analog, which is found in Ensembles > Classics > Synthesizer. It is a basic two oscillator with all the expected bells and whistles. A filter envelope, amp envelope, LFO, stereo delay and a nice scope to see your sound wave in real time. If you enjoy using this synth and like the sound quality, then I would suggest saving a new snapshot that is basically a fresh initialize patch. This way you can begin your sound design sessions without any influence from previous sessions or snapshots. For this sound, you will want to load a Pulse (Square) wave into both oscillator 1 and 2. They will be set apart by slight detuning, pitch and symmetry parameter settings. 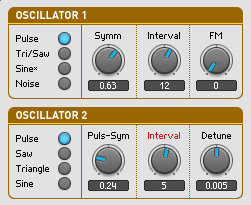 The mix of the two oscillators favors oscillator 2. A Lowpass 1 filter is added to the mix now. 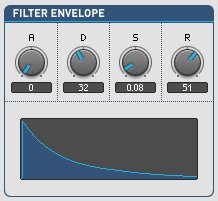 A Filter Envelope is set up and used to modulate the symmetry of oscillator 1. The Amp Envelope is set up and this is the main curve that will will affect the delivery and development of the sound overall. The Stereo Delay FX is used to extend this sound quite a bit, and there is a good amount of width added here. And on the Master panel, the Unison Voicing is detuned for more spread and interest. Below is a small audio sample of this pluck synth made with the Reaktor SoundSchool synthesizer playing alongside some drums to give you an idea of what it sounds like in a mix.